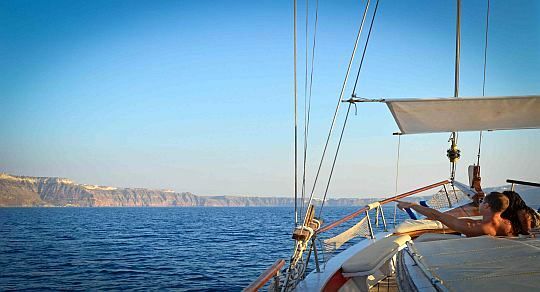 Technological advances in the nautical world have come along in leaps and bounds since the Middle Ages and yet you still cannot beat the magical experience of sailing through the Mediterranean onboard a traditional Greek Vessel. Flocks of wooden boats fill the Aegean and the Ionian Sea and these descendants of the Byzantine corvettes are very much a part of day-to-day life in the Greek islands today, just as they were more than a thousand years ago . 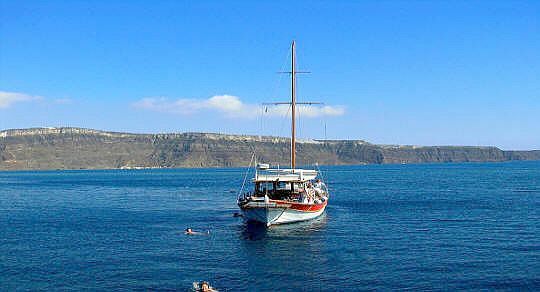 With Captain George and Santorini Yachting you will bob along the turquoise waters on board the S/Y Eleftheria. This beautiful wooden Greek sailboat boasts plenty of space for you and up to 22 of your guests to relax and provides enough shaded areas for a reprise from the suns scorching rays, with plenty of room for everyone to have the space they need to either sit and enjoy sipping wine or lying back and sunbathing on the top deck. She is ideal for small groups, families and miscellaneous celebrations, for example: weddings, anniversaries, bachelor or birthday parties, etc. The design is based on crafts sailing the Aegean Sea for over 2,500 years. This unique design offers comfort and space and it’s the perfect sailing structure for the Aegean which has not been improved upon since the ancient Greeks mariners first sailed these waters. The Eleftheria was rebuilt in 2005 with a 15 meter mast, a long keel with permanent flaps that make sailing a joy. As we have found in our over 30 years of professionally sailing in the Aegean sea, most people on holidays would like to spend quality time some by getting involved with the sailing part of the trip, and some, just like to sit back, and enjoy the ride.If you are staying in Santorini overnight then you will be sure to catch the famous west coast sunset, followed by a romantic candlelit dinner overlooking the golden hues of the glistening surface. Very few things in life will leave you feeling more special and privileged. 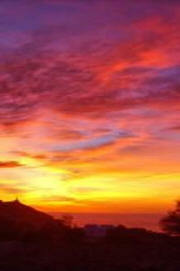 That is until you embark on our sunset cruise travelling through the deep blue waters of the caldera. Enjoy the intimate privacy while you are out at sea and your only surroundings are the tranquil waters of the Aegean. Eleftheria in Greek means “freedom, liberty, independence” and on board this boat that is exactly what you will receive. A memorable journey with our sunset cruise will ensure your undying love for one another and for this fantastic destination that will last a lifetime. Once aboard, and while having a welcome drink you can discuss the details of your cruise. That can make a difference and together we will find what is the best route to follow. Our blend of hospitality and exclusivity will offer you ( or your clients ) the best possible experience while visiting Santorini. We look forward to further cooperation with you and are open to any questions, requests or suggestions you may have. The S/Y Eleftheria has all the safety equipment and facilities along with the know-how to assure a safe trip.